This article by the Associated Press on Mexico’s historic justice system reform was published Saturday June 18 in the New York Times. 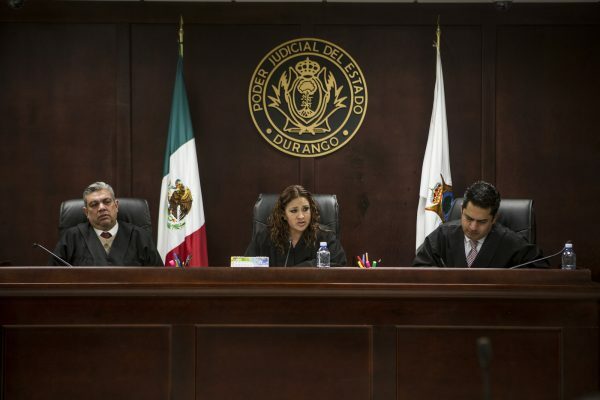 MEXICO CITY — It would have seemed routine in many places: A defendant accused of illegally possessing a gun sat across a gleaming courtroom from the judge who accepted his guilty plea and would pronounce his sentence. For Mexico, though, it was a remarkable change from a century-old judicial system of paper-shuffling court cases in which defendants rarely actually testified before the judge ruling on their fate from within a cramped, bureaucrat’s office. As of Saturday June 18, the open, oral trial is the norm nationwide as part of a sweeping judicial reform. Defense attorney Juan Manuel Gutierrez Cazares said that will be a jarring change. “In 95 percent of cases the defendant never sees the judge (under the old system),” said Gutierrez, who after a 15-year legal career was working on his first oral hearing in a Mexico City courtroom that opened just three months earlier. The oral hearings are the final stage of reforms passed in 2008 that seek to change every step of the criminal justice system, from the time police arrive at a crime scene to the moment a sentence is imposed. Some have expressed concern that until Mexico’s notoriously corrupt and poorly trained police are capable of operating in the new system, cases could be scuttled by their errors. Reliance on confessions — often obtained through torture — as the ultimate piece of evidence evaporates under the new rules. Now a confession is just one piece of evidence and worthless unless made before a judge. There are estimates that only one or two of every 100 crimes committed leads to a sentence in Mexico. The reforms aim to reduce impunity for lawbreakers and increase the public’s faith in legal institutions. Some states have used oral trials for years, while others scrambled to make the Saturday deadline for the new system. Some 300,000 police officers have undergone training for their roles in the new system, learning how to better preserve a crime scene and how to testify in court. The same goes for lawyers and judges. The system also incorporates non-prison alternative rulings, such as mediation and reparations, in an effort to reduce the country’s swollen prison populations. Maria de los Angeles Fromow, the federal official charged with coordinating implementation of the reforms, said they strengthen the presumption of innocence and give a greater voice to victims, who are now supposed to have advocates from the start. With thousands of cases still in some stage of the old process, it will function in parallel with the new system for an estimated three to five years, she said. For example, in a local courthouse close to where the federal weapons case was heard, a convict seeking early release under the old system was questioned through a barred opening by a judge in another room. But at the federal court the next day, in a new courtroom of shiny granite floor tiles and light wood accents, the defendant facing a gun charge sat in street clothes beside his lawyers. Judge Gerardo Moreno Garcia, dressed in a black robe with red trim, addressed him repeatedly, painstakingly explaining every step of the process. The defendant had been free on bond since his arrest three months ago. Under the old system, he almost certainly would have spent that time in prison, mixed in with murderers, rapists and kidnappers. And when his case finally did begin to move, everything would have been done outside the public’s view — even his own. In the past, testimony and motions were conducted on paper, reams and reams of it, passed back and forth to judges who few ever saw. Instead, over the course of the two-hour federal hearing, the defendant accepted responsibility, prosecutors agreed he qualified for a sentence less than the three-year minimum prison term and he received his reduced sentence. And it all occurred in open court. “It is a reform that emerged from social organizations, an important demand for transparency, toward reducing the margins for impunity, granting attention owed to victims and guaranteeing human rights,” said Fromow, the federal official overseeing implementation of the changes.